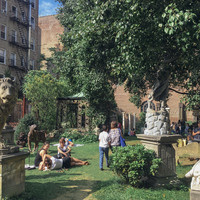 Little Italy's Elizabeth Street Garden is a community sculpture garden with over 100,000 visitors a year and year-round free public programs. Currently, the City and NYC Housing Preservation & Development (HPD) plan to destroy the garden to develop affordable housing, office space, and luxury retail, despite a proposed alternative site for the planned development. These propositions have set up a false choice between the community's needs for public green space and affordable housing, and reflect crucial issues with City planning and the livability of New York. Join community garden representatives, activists, and scholars, as they explore access to public green space and the availability of affordable housing in a constantly changing city through the lens of Elizabeth Street Garden. The panel will be moderated by Mia White, Assistant Professor of Environmental Studies at The New School. Introductory remarks will be provided from Joseph Reiver, Executive Director of the Elizabeth Street Garden. Click here to submit your question for consideration to be discussed by the panel. Presented in collaboration with McNally Jackson, Elizabeth Street Garden, the Environmental Policy & Sustainability Management (MS) Program, Environmental Studies (BA/BS) Program, and the Urban Systems Lab at The New School. Free and open to the public. Seating is first come first served.